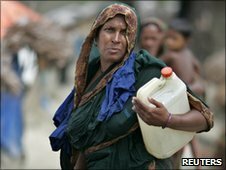 Up to 77 million people in Bangladesh have been exposed to toxic levels of arsenic from drinking water in recent decades, according to a Lancet study. The research assessed nearly 12,000 people in a district of the capital Dhaka for over a period of 10 years. More than 20% of deaths among those assessed were caused by the naturally occurring poisonous element, it found. The World Health Organization said the exposure was “the largest mass poisoning of a population in history”. It began after hand-pumped wells were installed in the 1970s to tap groundwater. Scientists say even small amounts of arsenic over a long period can cause cancer of the bladder, kidney, lung or skin. Bangladesh was chosen for the study because nearly 90% of the population uses groundwater as its primary source of fresh water. DHAKA: Bangladesh and India have agreed to resolve outstanding issues relating to water sharing and decided that they will jointly start work for the protection of banks of the common rivers. The consensus came at the end of the two-day crucial water talks at the Secretary level here on Tuesday. Water Resources Secretary Umesh Narayan Panjiar told journalists that the dredging of the Isamati river would start on February 1. On the Teesta deal, he said the talks narrowed the gap but further talks were needed. “The meeting, recognising the suffering of the people of both sides in the face of scarcity of lean season flows of the Teesta river, discussed at length and expressed that the sharing of the Teesta waters between India and Bangladesh should be concluded expeditiously,” the two sides said in a joint statement. The talks were held in the hope of crafting an accord for Bangladesh Prime Minister Sheikh Hasina and Prime Minister Manmohan Singh to sign in Delhi later next week. The Bangladesh side was headed by Water Resources Secretary Shaikh Mohammed Wahid-uz-Zaman while Mr. Panjiar headed a seven-member Indian delegation. “We arrived at a situation which will benefit the people of the two countries,” Mr. Zaman told journalists. Dhaka has been pressing New Delhi for decades for a deal on the common river Teesta, on which Bangladesh has its largest irrigation project covering 7,50,000 hectares in the greater Rangpur region. The joint press statement said talks between the two countries would continue on the Teesta river. The two countries also agreed to continue dialogue on the modalities for withdrawal of water from the Feni river by both sides for the minor lift irrigation schemes. The meeting also agreed that water may be withdrawn from the Feni for drinking supply scheme for the Subroom town, which would be put into operation immediately after joint verification. The meeting agreed to commence pending river bank protection works along the common rivers from early February. It also took note of new lists of proposed bank protection works and embankments along the common or border rivers, and directed the members of the Joint Rivers Commission to finalise the same for implementation. Mr. Panjiar invited Mr. Zaman to visit Indian institutions relating to water resources with a view towards enabling participation from Bangladesh in the training programmes. Mr. Panjiar later paid a courtesy call on Bangladesh Minister for Water Resources Ramesh Chandra Sen. Welcoming the Indian delegation, the Minister expressed satisfaction on the outcome of the talks and expressed hope that all outstanding issues relating to the common rivers would be solved expeditiously through discussions. DHAKA: Bangladesh and India on Monday began Secretary-level talks here on river water-sharing to lay the groundwork for the coming summit talks between their Prime Ministers. Bangladesh Water Resources Secretary Sheikh M. Wahiduzzaman, who leads the home side, said the sharing of the waters of the Teesta and Feni and the construction of embankments were on the agenda of the two-day discussion. The Indian team is led by Water Resources Secretary U.N. Panjiar. Even if the talks fail to arrive at a full-fledged agreement, Prime Ministers Manmohan Singh and Sheikh Hasina could make decisions on signing a short-term Teesta deal, officials said. Officials of the Ministries concerned said a full-fledged agreement on Teesta water sharing depended largely on the highest political levels. Dhaka is asking New Delhi to hold a ministerial-level meeting of the Joint Rivers Commission (JRC), but it is learnt that India has expressed its inability to hold such meeting in the last six years. The talks will also include the sharing of water of six other common rivers — the Dharla, Monu, Muhuri, Dudhkumar, Khowai and Gomti. The dredging of the Isamoti may also come up for discussion. Newly-appointed Indian High Commissioner Rajeet Mitter told journalists that Ms. Hasina’s visit to India, scheduled for January 10, would usher in new areas of cooperation. LONDON – A retired Indian engineer has claimed to have “built” 12 new glaciers, in an effort to stop global warming melting away the Himalayan glaciers. According to a report in the Telegraph, Chewang Norphel, 76, has said that he “built” 12 new glaciers already and is racing to create five more before he dies. By then, he hopes he will have trained enough new “icemen” to continue his work and save the world’s “third icecap” from being transformed into rivers. The great Himalayan glaciers, including Kashmir’s Siachen glacier, feed the region’s most important rivers, which irrigate farm land in Tibet, Nepal, Bangladesh and throughout the Indian sub-continent. The apparent acceleration in glacial melting has been blamed for the increase in floods which have destroyed homes and crops. Chewang Norphel, the “Iceman of Ladakh”, however believes he has an answer. By diverting meltwater through a network of pipes into artificial lakes in the shaded side of mountain valleys, he says he has created new glaciers. A dam or embankment is built to keep in the water, which freezes at night and remains frozen in the absence of direct sunlight. The water remains frozen until March, when the start of summer melts the new glacier and releases the water into the rivers below. So far, Norphel’s glaciers have been able to each store up to one million cubic feet of ice, which in turn can irrigate 200 hectares of farm land. For farmers, that can make the difference between crop failure and a bumper crop of more than 1,000 tons of wheat. Norphel’s work has now been recognized by the Indian government, which has given him 16,000 pounds to build five new glaciers. Abu Dhabi, Oct 23 (IANS) Officals of seven South Asian countries met here Oct 22-23 to promote water cooperation on the rivers of greater Himalayan region, WAM news agency reported. Government officials, politicians and water experts from Afghanistan, Bangladesh, Bhutan, China, India, Nepal and Pakistan participated in the conference. The theme of the meeting was “First International Conference on Southern Asia Water Cooperation”. “Around 40 percent of the world’s population and 50 percent of the farm land depend on more than 245 rivers (in the region). Despite this fact, there are no international agreements that govern the use of these resources,” Mohammed Al Bowardi, managing director of Abu Dhabi environment agency (EAD) said at the conference Thursday. “This drives us to be even more careful with he management and distribution of these important resources to avoid conflict among countries with shared borders,” he said. “I would like to take this opportunity to invite all participants in this dialogue to develop the necessary frameworks to contribute to global efforts to protect our natural resources and to mitigate the effects of climate change, because of their significant environmental, economic and political impact,” he added. Hundreds of Bangladeshi boys who worked as camel jockeys in the United Arab Emirates have begun receiving compensation from the Gulf state. Many of the boys, who were trafficked and lived on camel farms for years with no contact with their parents, broke limbs falling from the camels. The boys, who were as young as three, say they were starved by the camel owners to keep their weight down. The Gulf state outlawed the use of child jockeys in 2002. Then the UAE government agreed with the UN Children agency, Unicef, to co-operate on the “repatriation, rehabilitation and reintegration” of children involved in the sport. Some 900 boys, many of whom are now young men, are due to receive compensation, ranging between $1,000 and $10,000 each. The boys were prized as jockeys by the camel owners and race organisers because they were so small and because it was relatively easy and cheap get hold of them. Munna, who is now in his 20s, and his two brothers who were also camel jockeys, have just received compensation from the UAE government of about $5,000. He says he fell from a camel, which then trod on his arm and broke it – he says it still hurts and he cannot do any heavy work. “I suffered a lot there. It was a terrible place. No amount of money would be enough to erase those memories. But at least with this, I can start a little business. [The compensation] is good, but nothing would be enough,” he said. Another jockey, Salman, said life on the “camel farms” in the UAE was hard. “The camels used to kick us. When we rode the camels the owners would tie our legs to the saddles. But I would still fall off and get injured. Each time I fell off they put me back on the camel, then I fell off again, then they put me back on,” he said. Salman said the organisers would give the boys tablets to run the races. “Every week they used to give us tablets and every three months also they would inject us. They did this so we lost weight,” he said. Most say they were tricked into going to the Gulf state to work as camel jockeys. “We had no idea that’s what we were going to do when we went to Dubai,” says Munna. 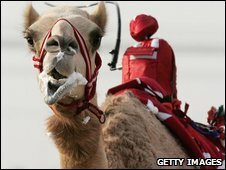 The use of children under 15 as camel jockeys was banned in the UAE in 2002. They were later replaced by robots.